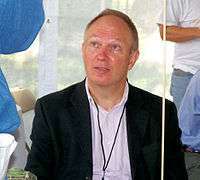 Ian Buruma in conversation at the 2006 Texas Book Festival in Austin. Ian Buruma (born December 28, 1951) is a Dutch writer and historian who lives and works in the United States. Much of his work focuses on the culture of Asia, particularly that of China and 20th-century Japan. He has been the Paul W. Williams Professor of Human Rights and Journalism at Bard College since 2003. He was born and reared in The Hague, Netherlands, to a Dutch father and British mother. He studied Chinese literature at Leiden University, and then Japanese film at Nihon University in Tokyo, Japan. He has held a number of editorial and academic positions, and has contributed numerous articles to The New York Review of Books. He has been noted as a "well-regarded European intellectual". In 2000 he delivered the Huizinga Lecture (on "Neoromanticism of writers in exile") in the Pieterskerk in Leiden, Netherlands. He has held fellowships at the Woodrow Wilson International Center for Scholars in Washington, D.C., and St Antony's College in Oxford, UK. In 2003 he became Luce Professor of Democracy, Human Rights & Journalism at Bard College, New York. Buruma is a nephew of the English film director John Schlesinger, with whom he published a series of interviews in book form. Buruma argues for wholehearted British participation in the European Union because they are the "strongest champions in Europe of a liberal approach to commerce and politics". In 2008 Buruma was awarded the Erasmus Prize, which is awarded to an individual who has made "an especially important contribution to culture, society or social science in Europe". Many liberals these days seem at pains to establish their bona fides as tough-minded hawks when it comes to global threats, but the Dutch man of letters has made a career out of affirming the classic liberalism of the open-door variety. His writing in recent years has attracted the ire of critics who think he equivocates on the dangers of radical Islam, but Ian Buruma made his response this year with a typically judicious and politically relevant book, Taming the Gods, that reflects on the Western capacity for religious pluralism. According to Buruma, Western society is robust enough to embrace even illiberal practices, so long as these are not violent. "Living with values that one does not share", he wrote in a recent column on France's burqa ban, "is a price to be paid for living in a pluralist society". In April 2012, he was awarded the Abraham Kuyper Prize for Excellence in Reformed Theology and Public Life at the Princeton Theological Seminary. Behind the Mask: On Sexual Demons, Sacred Mothers, Transvestites, Gangsters, Drifters, and Other Japanese Cultural Heroes. New American Library. 1983. ISBN 978-0452010543. A Japanese Mirror: Heroes and Villains of Japanese Culture. London: Jonathan Cape. 1984. ISBN 978-0224020497. Murder in Amsterdam: The Death of Theo Van Gogh and the Limits of Tolerance (2006) ISBN 978-1-59420-108-0 winner of The Los Angeles Times Book Prize for the Best Current Interest Book. Commentary on the History of China for the time period of The Last Emperor, The Criterion Collection 2008 DVDs (ASIN: B000ZM1MIW, ISBN 978-1-60465-014-3). Taming the Gods: Religion and Democracy on Three Continents (2010) ISBN 978-0-691-13489-5, with some historical examples of the value the separation of religion and national governance with the separation of church and state as one example. Grenzen aan de vrijheid: van De Sade tot Wilders (Limits to Freedom: From De Sade to Wilders) (2010) ISBN 978-90-477-0262-7 – Essay for the Month of Philosophy in the Netherlands. Year Zero: A History of 1945. New York, NY: The Penguin Press. 2013. ISBN 978-1594204364. ↑ "Bard Faculty: Ian Buruma". Bard College. Retrieved 5 November 2014. ↑ Grimes, William (13 September 2006). "Bumping Into Boundaries in a Land of Tolerance (book review". New York Times. Retrieved 27 January 2016. ↑ Peter Collier"Backbone, Berman, and Buruma: A Debate that Actually Matters", World Affairs Journal. ↑ "In praise of Englishness". The Economist. 23 October 2001. ↑ "Former Laureates: Ian Buruma, 2008". Praemium Erasmianum Foundation. Retrieved 5 November 2014. ↑ "The FP Top 100 Global Thinkers", Foreign Policy, 29 November 2010. ↑ "The Kuyper Prize". Princeton Theological Seminary. Retrieved 5 November 2014. Wikimedia Commons has media related to Ian Buruma. "Ian Buruma collected news and commentary". The New York Times.